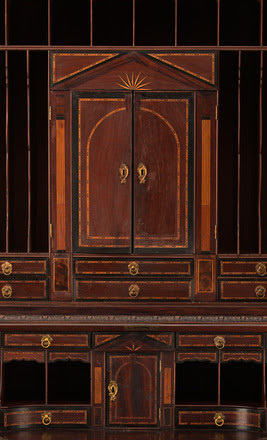 The Drayton Hall desk and bookcase was recently conserved at Colonial Williamsburg. Gift of Charles H. Drayton and Martha Mood. This rare, English-made desk and bookcase (c. 1745) is the most significant piece of furniture in Drayton Hall’s collection. 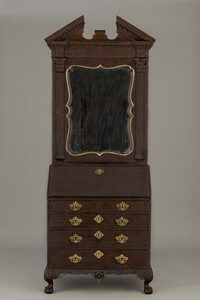 Described by Ronald L. Hurst, Vice President, Collections, Conservation, and Museums at Colonial Williamsburg, as “the finest example of furniture to survive from Colonial America,” this exquisite piece is a testament to John Drayton’s wealth and sophistication, and his position as one of colonial America’s most significant merchant planters. This elaborate example of mid 18th-century British case furniture may have been located within Drayton Hall’s withdrawing room. Completed with 13 secret compartments, gilt rococo, brasses, and delicate wood and tortoise shell inlays, this object is one of the finest examples of furniture to survive from colonial America. Shielded behind the paneled mirror and fall-front of Drayton Hall’s desk and bookcase is an architecturally-inspired interior fabricated with exotic woods from around the globe, tortoise-shell inlay, and gilt brass hardware. A series of 28 delicate drawers, a locking cabinet at the center of the bookcase, and a prospect below, form a balanced appearance and conceal 13 secret compartments. Check out the desk and bookcase and 26 other pieces from Drayton Hall at the DeWitt Wallace Decorative Arts Museum’s exhibit A Rich and Varied Culture: The Material World of the Early South.